Review article: Effectiveness of ultra-brief interventions in the emergency department to reduce alcohol consumption: A systematic review. McGinnes R.A., Hutton J.E., Weiland T.J. et al. Emergency Medicine Australasia: 2016, 28, p. 629–640. Unable to obtain a copy by clicking title? Try asking the author for a reprint by adapting this prepared e-mail or by writing to Dr McGinnes at rosemary.mcginnes@monash.edu. With the large number of people vulnerable to the harms of risky drinking attending emergency departments, an effective ultra-brief intervention would have the potential to make a measurable population impact. However, as this review suggests, no such ultra-brief intervention has yet been found. Summary Acute and chronic alcohol-related harm is more prevalent in emergency departments than the general population. The World Health Organization recognises emergency department patients as an at-risk group, and recommends they receive alcohol screening and brief intervention, and referral to treatment. Emergency departments are prime settings for brief interventions given the high prevalence of patients experiencing alcohol-related harm. However, the hectic and fast-paced environment can make it difficult to deliver them. While in principle a more feasible option, this review of ultra-brief interventions (lasting less than 10 minutes) found limited benefit in the short-term. With further research warranted, the reviewers stressed that finding an effective ultra-brief intervention would have the potential to make a measurable population impact. Although evidence exists for the effectiveness of brief alcohol interventions in inpatient and primary care settings, their effectiveness in emergency departments is unclear. However, patients might be more conducive to a ‘teachable moment’, particularly when they attribute their attendance to alcohol. Delivered in less than 10 minutes, sometimes using computer technology, ultra-brief interventions may help to overcome common barriers to implementation in emergency departments, including the significant demands on staff. The featured paper reviewed studies of ultra-brief interventions in emergency departments to gauge their effectiveness. A total of 13 studies described in 19 papers met the inclusion criteria. They were conducted between 1999 and 2010, published between 2006 and 2012, and took place in the United States, Australia, Germany, Sweden, and the United Kingdom. Ultra-brief interventions tested in six studies used a face-to-face interaction of 10 minutes or less (1 2 3 4 5 6) [two of the studies are available in the Effectiveness Bank here and here], three used a computer intervention (7 8 9), two a mobile phone intervention (10 11) [see one examined in the Effectiveness Bank], and two a pamphlet only (12 13) [see one examined in the Effectiveness Bank]. The review found no evidence that ultra-brief alcohol interventions were effective in terms of avoiding return visits to the emergency department, or reducing frequency of drinking and AUDIT questionnaire scores indicative of risky drinking. • After three months, participants randomised to receive personalised feedback showed a significant reduction in the number of heavy-drinking days in the past month, compared with the assessment-only group. • Three months later, patients given a text message with feedback were 2.4 times more likely to not report binge drinking in the previous 30 days than the control group (consisting of a local list of treatment services). • After 12 months, participants randomised to a brief negotiated interview [a type of brief intervention based on the principles of motivational interviewing] conducted by trained emergency department staff (with or without a one-month telephone booster call) reported fewer binge-drinking days in the previous 28 days compared to participants receiving standard care. • Patients receiving brief advice significantly reduced their average consumption during the 12 months of the study compared to people not receiving advice. There was no difference between customised, computer-generated advice versus generic printed advice. • A significant treatment effect was shown at 12 months with a brief negotiated interview (with or without a telephone booster at one month), with both interview groups consuming significantly fewer drinks per week than the standard-care group. • There was a significant reduction in the number of drinks consumed per week six weeks after a mailed pamphlet with normative feedback and strategies (versus assessment and no feedback). • High-risk drinking patients showed a significant reduction in average weekly consumption with customised, computer-generated feedback (versus routine emergency department procedures). This translated into a small effect size at six months, which persisted at 12 months. • At three months, participants receiving a weekly text message with personalised feedback showed a significant reduction in both the number of drinks per drinking day and the number of drinks per drinking day in the past month versus participants receiving assessment only. • Patients attending the emergency department whose screening results indicated hazardous drinking were randomly assigned to a text message intervention (with or without feedback) or to a control group. The text message plus feedback group showed a significant reduction in the number of drinks per drinking day at three months. With the large number of people vulnerable to the harms of risky drinking attending emergency departments, an effective ultra-brief intervention would have the potential to make a measurable population impact. However, as this review suggests, no such ultra-brief intervention has yet been found. While there was a small reduction in quantity of alcohol consumed between six weeks and 12 months after interventions were delivered, there was less consistent evidence of any reduction in binge drinking, and no effect on future visits to the emergency department. Given the small number and moderate quality of these studies, further research is warranted. commentary The featured paper reviewed the effectiveness of ultra-brief alcohol interventions in the emergency department, finding in the short-term that they could reduce heavy drinking and the quantity of alcohol consumed, but not reduce frequency of drinking, screening scores indicative of risky drinking, or return visits to the emergency department. The authors praised the potential population-level benefits of implementing effective brief interventions in emergency departments, but equally the difficulty of delivering them in an environment where staff are under significant time and resource pressures – a tension which exemplifies the draw of ultra-brief interventions. However, the review fell short of being able to pronounce on the relative feasibility of ultra-brief interventions in emergency departments because three out of six studies producing positive findings used researchers in the delivery of the interventions as opposed to regular staff, making the studies less representative of real-world practice. Emergency medicine runs the gamut from major trauma and medical emergencies to minor injuries and illness. The British Medical Association describes the working environment as “often hectic and unpredictable … fast-paced, challenging and heavily multidisciplinary”. Even when emergency department staff perceive one of their roles to be providing preventive services, there are numerous barriers to delivery. A number of initiatives have been rolled out in primary care aimed at “reducing unscheduled care needs” and alleviating the strain on hospitals, including incentivising general practitioners to improve chronic disease management, crisis intervention teams for mental health problems, drug and alcohol services, rapid response teams, community matrons and schemes such as home care respiratory teams (1 2). However, there remains a vulnerable patient population, referred to as “frequent attenders”, who disproportionately rely on the emergency department to meet their healthcare needs, and who are more at risk of alcohol-related harm and interrelated issues such as homelessness and mental health problems. For example, a review of people who attended the Royal Lancaster Infirmary emergency department ten times or more over a 12-month period found that concurrent drinking or a history of alcohol dependence was reported in over half of patients (55%). As the featured paper noted, the World Health Organization recognises the prevalence of alcohol-related harm in emergency departments, and recommends patients receive alcohol screening, brief intervention, and referral to treatment. However, UK policy has now (nearly) abandoned universal screening, opting instead for a more targeted approach. The ambition in England and Scotland has been scaled down to screening new patients, screening during health checks, and/or ‘targeting’ screening only at patients thought to be at risk, while Wales has opted for discretionary and less structured interventions for lifestyle risks in general. In 2010 (and again in 2017), the UK National Screening Committee, a body which advises on national screening campaigns for illnesses such as bowel and breast cancer, decided against universal screening for “alcohol misuse” in adults on the grounds that there was no screening test which met their criteria, and “a lack of evidence that a population screening programme would improve morbidity and mortality or would reduce social harm”. 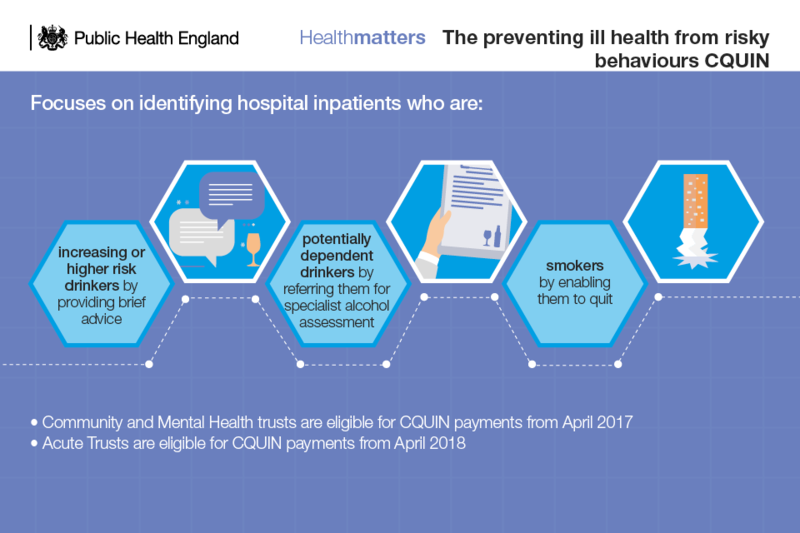 Under the Commissioning for Quality and Innovation (CQUIN) scheme, the “preventing ill health” indicator encourages targeted action to tackle risky behaviours among adult hospital inpatients, with a focus on alcohol consumption and smoking. Complementing this work, are free e-learning courses from Health Education England on alcohol identification and brief advice, and “very brief advice” on smoking. In 2012, the year these unexpectedly negative findings emerged, Professor Nick Heather, who was the first researcher to evaluate a brief alcohol intervention in primary care, argued that “Widespread dissemination of [screening and brief intervention] without the implementation of alcohol control measures … would be unlikely on its own to result in public health benefits”. This was a significant change in tone from 2006, when he optimistically referred to the “steadily gathering momentum” of an “international movement dedicated to reducing alcohol-related harm by achieving the widespread, routine and enduring implementation of screening and brief intervention”. This about-turn is the focus of a Drink and Drugs News article (based on the above Effectiveness Bank hot topic). Although the utility of longer interventions cannot yet be written off, other UK studies have also failed to find that longer and more elaborate interventions improve outcomes. There is, however, some support (1 2) for extending not so much the duration of a single-session brief intervention, but delivering the intervention in at least two stages separated by a period of time, such as a few weeks. For example, in a major US study set in trauma centres, brief motivational counselling was more effective than minimal advice only when combined with a follow-up ‘booster’ phone call.